We spent two nights anchored off Arki and on the second day rowed ashore to walk the short distance to Port Augusta, the small harbour on the island. We stopped for brunch and, later, had supper in one of the tavernas where the food was both excellent and good value. The harbour was full of yachts, including a Rival 41 called Amazone and we had a chat with the Dutch owner, Robert. She is a ketch so looks quite different from Lynn Rival, apart from the hull. The winds continued to be quite strong while on Arki and the temperature dropped to well below 25 degrees making us feel quite cold in bed! Next we sailed west to Patmos in F5-6. Since the trip was only 7 miles or so we only hoisted the genoa but were still managing 7 kts most of the time. We anchored in the head of the bay in Skala Patmos harbour, rather than on the quay where the wind would have been beam-on. After satisfying ourselves that the anchor was well dug in we rowed ashore and had supper in a seafood restaurant where again the food was really good and inexpensive. We're beginning to understand why the Dodecanese islands are so popular! Patmos is famous for its hilltop monastery, founded in 1088 and dedicated to St John, who supposedly wrote the Book of Revelations there. Thankfully the weather was relatively cool for our walk up the hill to visit the monastery and surrounding village. 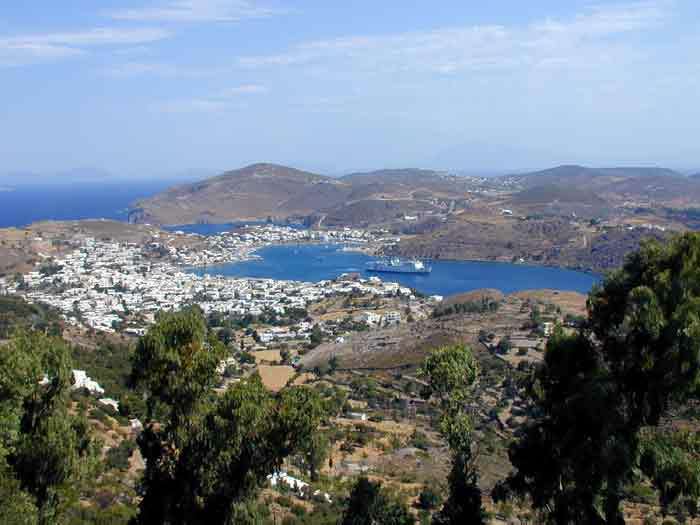 Luckily we chose a day when none of the numerous cruise ships that visit Patmos was in dock. 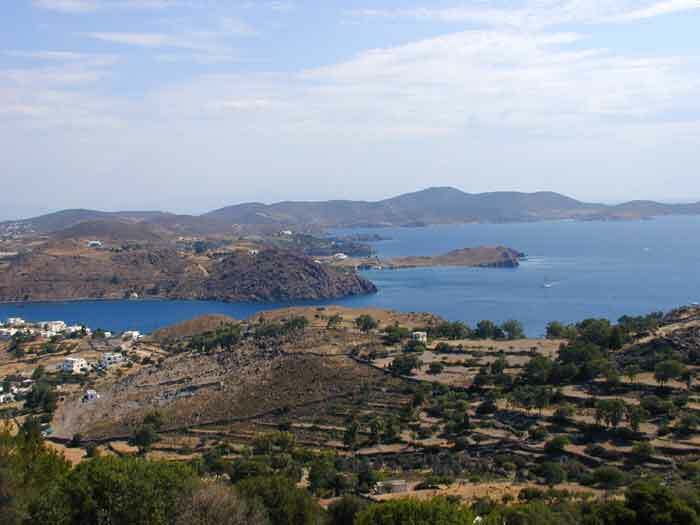 Despite all the tourism, Patmos remains very relaxed and the people very friendly. The scenery is also quite different from the other islands nearby as the rock is volcanic and porous, rather than the slabs of marble we found dominant elsewhere. We stayed three nights in Patmos harbour, as we were getting gale warnings on the weather forecast so it made sense to stay where the anchor was holding well. During our final evening, we were entertained by the comings and goings of the coastguard launch. A large gin palace had decided to leave and in the process of getting up it's anchor managed to pull up the anchors of two large (50 foot plus) Beneteaus. One of the Beneteaus only had one person on board so the coastguard was called upon to help. All was well in the end, with no apparent damage done. Although the wind was still quite strong on Friday morning we decided to move up the coast to anchor off one of the bays just north of the harbour. The wind was gusting 35 kts as we left the harbour but then settled down to gusts of 20 kts in the anchorage. The temperature has remained much cooler than we had expected for early July but it was nice to be able to have a swim in clear water. The bay had some development around it though was not very crowded. However, last night we were kept awake until the early hours with loud music coming from one of the beachside bars so know not to go there again on a Saturday night. Today we sailed east again, heading for Marathos, a small island just off Arki. 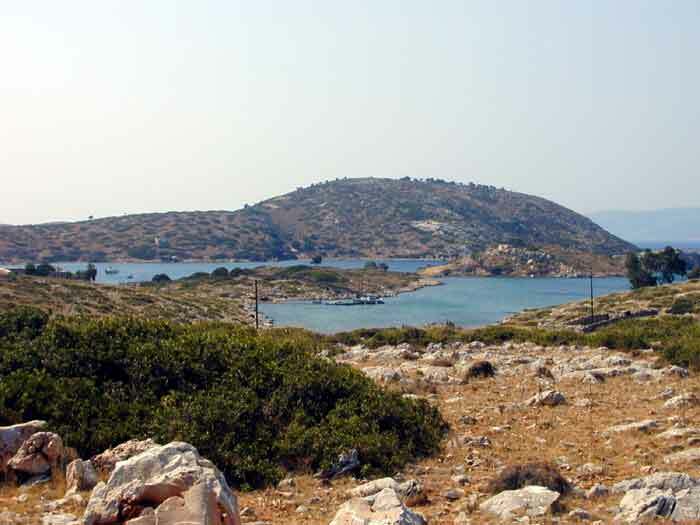 The only bay there has laid moorings available and a few tavernas ashore. We picked up a mooring, had lunch on board and were settled in when a launch came round to all the boats on moorings asking us to leave because "the water boat is coming". We're now on Arki again, at the quay in Port Augusta.